The jaw-dropping 50x lens may get all the attention, but the PowerShot SX50 HS' other new features are what makes this Canon's best super-zoom camera yet. It's impossible to review the Canon PowerShot SX50 HS without focusing on its 24-1200mm focal length - after all, it would be very costly and indeed difficult to replicate that range on a DSLR system, not to mention bulky and heavy too. We found that we got a surprising number of keepers at the 1200mm focal length, even when using the camera handheld, although most of the photos taken at the longer reaches of the zoom were inevitably shot at ISO 1600 when ISO Auto was on, not great considering the high levels of noise. What you gain in focal length, you lose in lens speed, with the maximum aperture of f/6.5 forcing the camera to use a higher ISO to maintain a fast enough shutter-speed (and often not achieving that). Still, you don't have to use the full telephoto range all the time, although we suspect that some users won't be able to resist, and mounting the camera on a tripod is essential if critical sharpness is required in anything but good light. Of more concern than noise is the obvious chromatic aberrations which rear their purple and green ugly heads wherever there's an area of high contrast in the image. Alongside the world's biggest zoom on a compact camera are a number of other, arguably more important, features that bring the SX-range up to speed with its main competitors. Chief amongst these are the welcome inclusion of the RAW format, a hotshoe for an accessory flash, a bigger handgrip, and a higher-resolution LCD screen. These improvements add up to make the Canon PowerShot SX50 HS much more of a viable alternative to a DSLR, and to its super-zoom rivals too. We are disappointed that the electronic viewfinder still only has a resolution of 202k dots, especially considering that it's imperative to compose your photos through the viewfinder given the huge focal range, and there's no automatic switching between LCD and EVF either when you hold the camera to your eye. 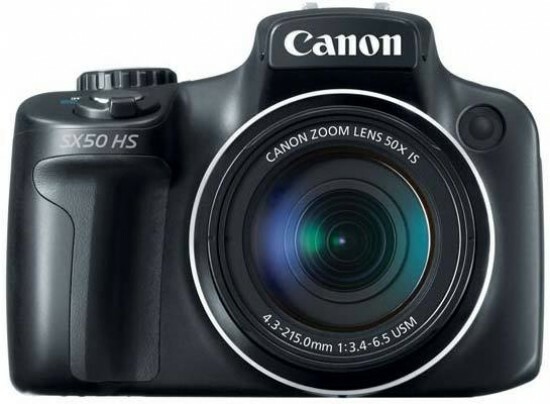 Whereas the previous SX40 HS felt predominantly like a fun tool for amateurs, the more DSLR-like Canon PowerShot SX50 HS with its improved image quality, new prosumer features, better handling and inevitably that 50x zoom lens make it a real alternative to a DSLR or compact system camera and a bag full of lenses.